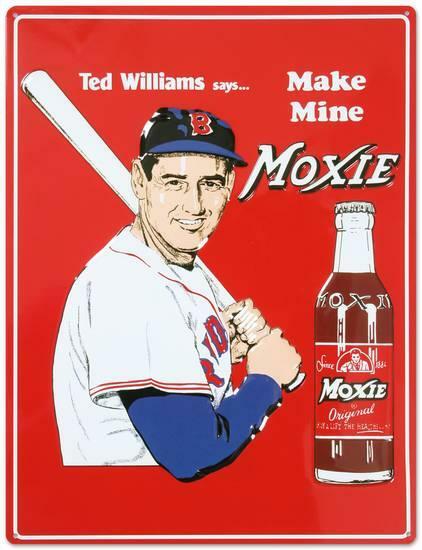 We notice Coca-Cola has recently purchased the rights to bottle Ted Williams favorite soft drink- Moxie from the Moxie Beverage Company of Bedford New Hampshire. It brought to mind an article we read in the Meddybemps Historical Society newsletter titled “Moxie Scandal in Meddybemps”. As scandals go it wasn’t really all that shocking but we did find it amusing. First however it might be helpful to provide some Moxie history for those unfamiliar with this New England curiosity. Locally, Beckett and Company of Calais began bottling and distributing Moxie about 1900. Moxie was developed in 1876 by a Dr. Augustin Thompson of Lowell Massachusetts as a “Nerve Food”. In the late 1800’s folks very rarely consulted a doctor when ill-they either went to the local apothecary and had him mix up a “prescription” or bought an over the counter bottle of some patent medicine which claimed, not without some truth, to have miraculous powers. Most of the apothecary prepared concoctions and the over the counter patent medicine’s magical powers were contained in substantial quantities of alcohol, cocaine or opium. Even it the medicine didn’t cure what ailed you, you really didn’t much care until the drug wore off and another dose was required. However these elixirs were expensive and habit forming so entrepreneurs like Dr. Thompson of Lowell Mass and our own Dr. Thomson of Sarsaparilla fame developed what were called “tonics” as general all purpose remedies. 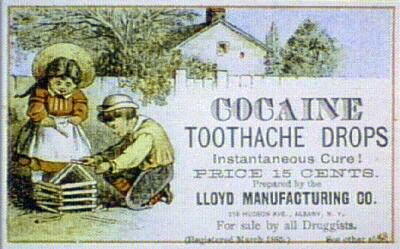 Coca Cola, which did contain cocaine in those days, was introduced about this time. These “tonics” were less expensive and not so lethal as patent medicines. Dr. Thompson claimed “Moxie Nerve Food” contained an extract from a rare South American plant which was effective against “paralysis, softening of the brain, nervousness and insomnia”. Moxie does actually contain an extract of gentian root which gives it its distinctive flavor. Moxie became the most popular “tonic” in the area. 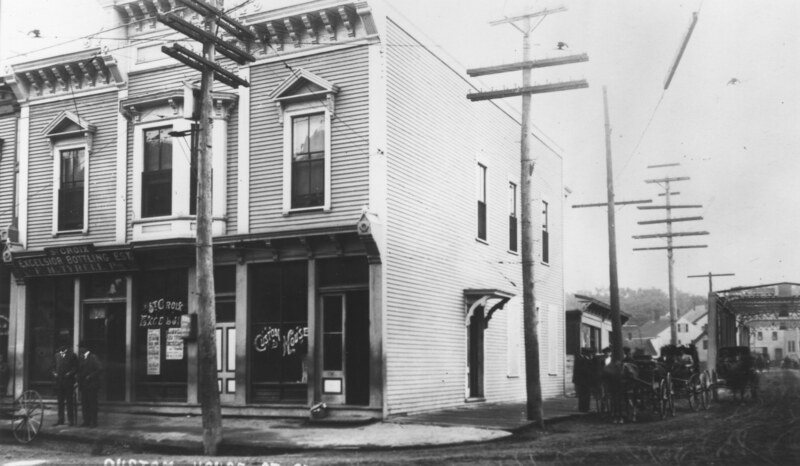 Beckett’s, first photo above, bottled and sold it in its store on Main Street. 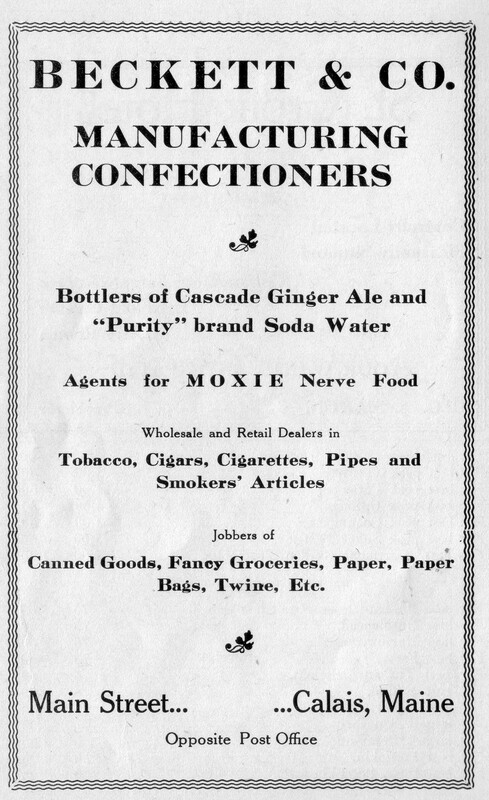 Even before the art of bottling “soda” was perfected Moxie as a medicinal tonic could be purchased at most stores. Later when it was marketed as a soft drink with “a delicious blend of bitter and sweet, a drink to satisfy everyone’s taste”, local soda fountains dispensed gallons of the drink. 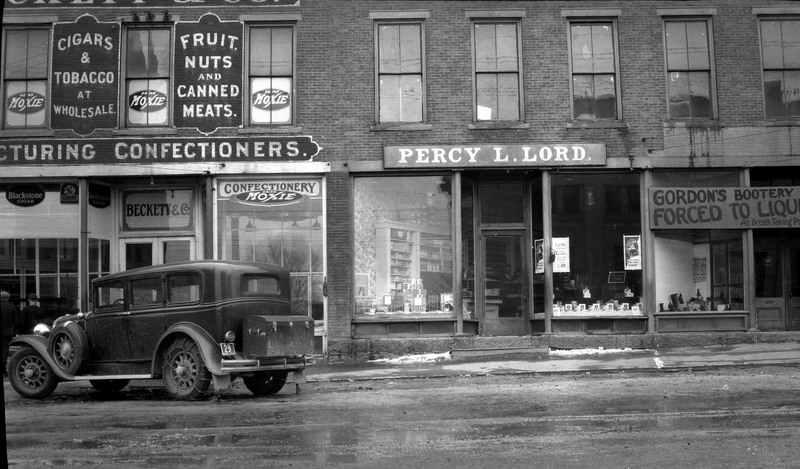 The second photo above is Whitlock’s store at the corner of North and Main which later became Stewart’s Furniture. 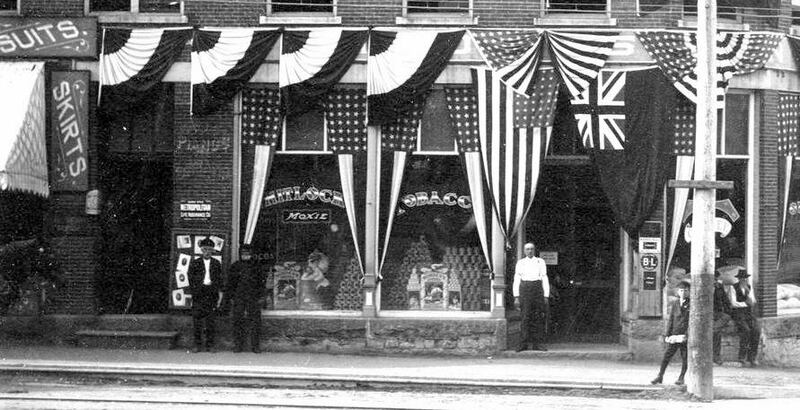 Note the “Moxie” logo is painted on the window as was the case of many Calais stores at the turn of the century. There were, however, those who thought describing Moxie as “delicious” was false advertising of the worst sort. Many found the flavor “curious” “distinctly different” or compared it to “rust, burnt rubber and battery acid”. This difference of opinion persists today. One of the true Maine traditions is swigging a bottle of Moxie after a hard day of picking blueberries. Moxie is the trademark of one of the oldest soft drinks… first bottled in 1884. Moxie is truly a unique drink. It is a drink that quenches thirst without the sweet aftertaste of drinks like Coke or Pepsi. While not considered mainstream by all Americans, many New Englanders still enjoy Moxie even today. Dear Sirs:On August seventh I bought three bottles of Moxie at Harry Lombard’s store, in Meddybemps, Maine. When I got to the camp I noticed they were without labels and each bottle had the same sort of cap to it. (I am sending you one of the caps.) One of the bottles was without a doubt a regulation Moxie bottle, stamped with your mark, but the other two were marked ‘Four Crown Soda Water, Clark’s Harbor, N.S., M.A. Nickerson.’ They all contained the same kind of drink (imitation Moxie) which made two members of the party extremely ill for about six hours. We have been drinking Moxie all our lives and it has never before made us ill. I do not wish to make any claims but I do hope that you will follow up, for the vile stuff was bottled in one of your bottles which I will be glad to send you upon your request. My reason for writing this is to save someone else from a similar experience. 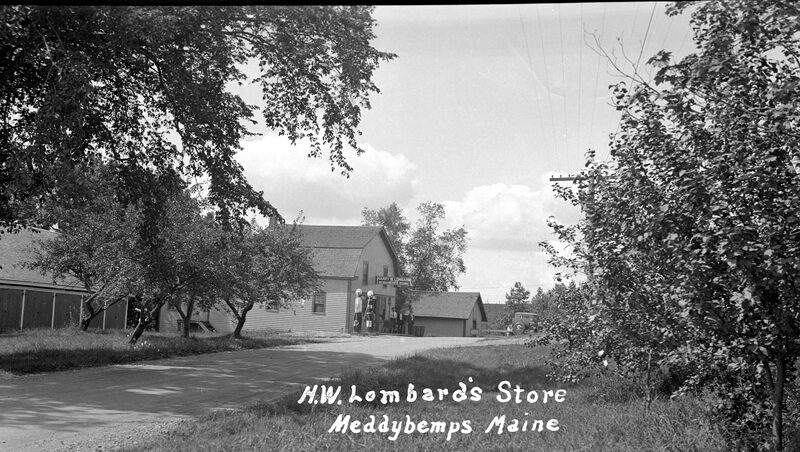 The Moxie Company immediately dispatched an inspector to interview Mr. Lombard in Meddybemps and learned that he was selling a beverage put up by Walter J. Commins, of Calais, Maine which had the appearance of Moxie. ‘Of course,’ The Moxie Company’s letter to Miss Sarah F. Shaw related, ‘as is usual in such cases, he (Mr. Lombard) denied having sold any of the Commins beverage upon a call for Moxie. We did warn you it was not much of a scandal. As to the perpetrator, one Mr. Walter Commins, we can assure you he was not a resident of Calais but a miscreant from across the line in St. Stephen. The Calais and St Croix Bottling Works which produced the offending Moxie is pictured above. The business was started by F.H. Tyrell before 1900. In 1917 it was located on Water Street in St. Stephen, the first building on Water Street after crossing the bridge. To the right in the photo is the old steel bridge looking toward Calais. Canadian Customs and Mr. Tyrell’s Calais and St. Croix Bottling works can be seen to the left. Mr. Tyrell also had a bottling works in Calais from the late 1800’s to about 1910 on Main Street. In 1891 Walter Commins married Tyrell’s daughter Ellen in the Milltown Catholic Church and was apparently taken into the family business. It was Walter who was responsible for duping Mr. Lombard if in fact Mr. Lombard was duped. Eric Olanski believes he was and we have no evidence to the contrary. However business in those days was totally unregulated and sharp practice was more the rule than the exception. We expect Mr. Commins sold a lot of phony Moxie before he was caught. The Moxie formula remains essentially unchanged. Those who haven’t had a Moxie experience should buy a bottle and decide for yourself- a “delicious blend of bitter and sweet” or more like drinking “rust, burnt rubber or battery acid”. For Moxie haters and lovers there is no in between.